A summer nature table is a space in the home used for placing handmade and natural items that reflect the season. It is meant to be explored, played with, and used as a way to study nature in the home. Nature tables are also perfect for sensory and imaginative play and are often used in Montessori and Waldorf education. 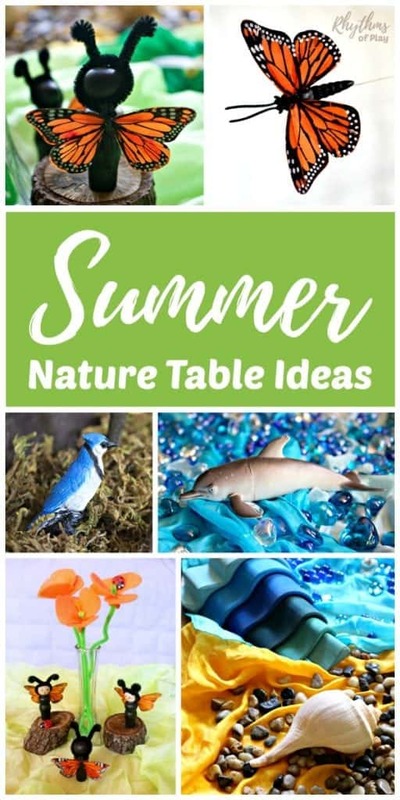 I have found that having a summer nature table is a great way to get kids outside exploring nature and learning in the summertime. There is so much more going on than the simple collecting and admiring of these natural materials. Talk with your kids about what they find to help them learn more about the world around them. It’s very exciting for my daughter to find natural objects during the summer months to take home to explore in more depth. The sparkle I see in her eyes when she declares that she is going to bring something home for the summer nature table makes it all worthwhile. Studying the season of summer is not the only use for a summer nature table. Playing with summer nature tables provides a rich sensory experience for the child. They are also wonderful for imaginative play. There are many wonderful ways to design a nature table. The space you have, your purpose, your interests, the resources you have available, the age of your children, and your mood will all influence the nature table you create. Making a summer nature table is simple. You can be as minimal or as extravagant as you please. The basic idea is to place items on it that your children find in nature and items that reflect the summer season. Get outside on a nature hunt to collect things to bring home to explore in more depth. Create summer arts and crafts to place on it. Links to some ideas are provided below. Dig your summer box out of storage and find things to display that you love. Place sentimental objects that are okay for your children to touch and play with. Make is something meaningful for you and your family and you can’t go wrong. In Waldorf education, playsilks are often draped on the nature tables and used to create nature scenes like the one above. We used silks in emerald, lime, gold, and turquoise to create meadows, grasses and a beach with an ocean to make our summer nature table. Next, we added aquamarine glass gems, royal blue marbles, and clear gems on top of a blue playsilk to give it the feel of water and waves. Please don’t include small or breakable objects if your children are very young. Then we added some shells and pebbles to create the feel of a rocky shore. To make it even more fun we added water (wave ) and air (rainbow ) as elements of nature. We placed birds and some sea animals on our table for my daughter to play with. She likes to use these for imaginative play on our summer nature table. 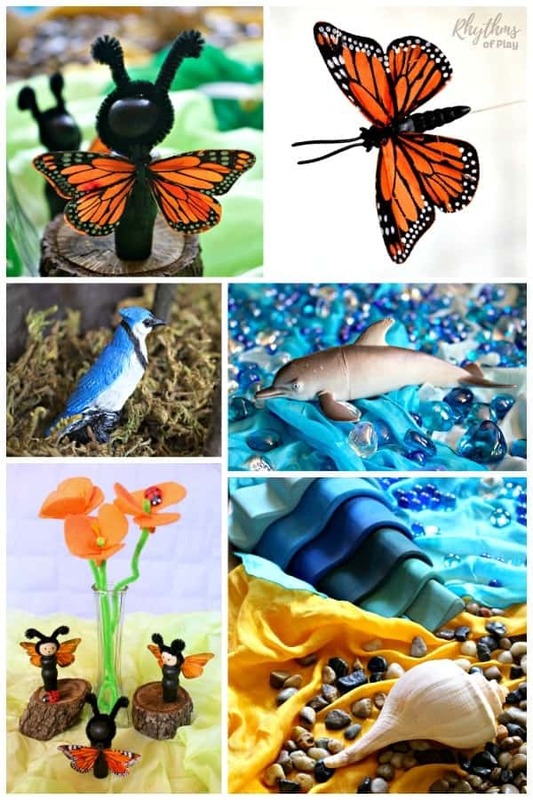 Although these represent animals in nature, they are not made of natural materials. It’s also a great idea to keep seasonal books on or under our nature tables. Gerda Muller has a book for each season that we love. We always include her seasonal books like “Summer ” on our nature tables. My daughter and I had a great time collecting and painting rocks to put on our nature table and put out in our garden. Another summer handmade craft we designed for our nature table were these cute little Monarch butterfly peg dolls. We used pieces from the oak tree in our backyard to make stands for the monarch butterfly peg dolls. My husband used a saw to cut these piece from a fallen branch. My daughter has a bunch more that she uses as blocks. We usually use fresh flowers but this year we made some Golden Poppies that we put on our nature table. After we went on a nature scavenger hunt, we placed the nature sensory bin we made under the table with blooming herbs to smell, small pine cones, sticks, feathers and rocks my daughter collected. Use any natural materials found in your area at this time of year to make a nature sensory bin or basket. Nature sensory baskets should be kept on or near the nature table. If you do not want to look at your nature sensory bin, it can be slid under the table so your child can easily access it. 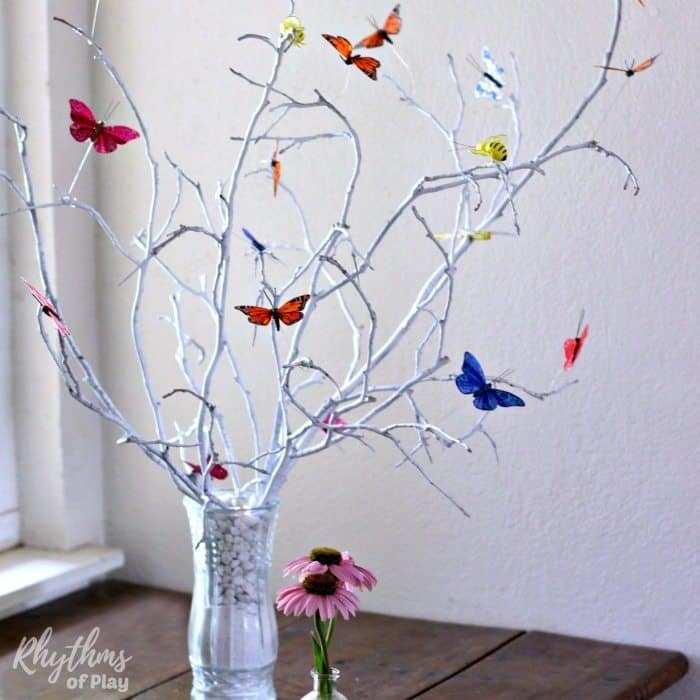 One summer we created a butterfly tree for our summer nature table by attaching Monarch butterflies, feather dragonflies, and bumble bees to branches. We kept our table really simple and only had our butterfly tree, summer book, nature sensory bin, and fresh flowers on it. You can see an echinacea flower from our garden on the table in the photo below on the day that I took a picture of it. Related: Sand and Water Tables Kids LOVE! Anything from nature that is safe for children to handle and play with. Anything else that reflects the season, holiday, festival, culture, or family values. *Please don’t include anything that is unsafe for your child to touch or play with. Keep small and breakable objects off the table until your child is mature enough to handle them. For more nature table ideas don’t forget to have a look at our autumn, winter and spring nature tables. A summer nature table is a space in the home for placing natural items that reflect the season. It is made to be explored, played with, and used as a way to study nature in the home. Nature tables are great for sensory and imaginative play and are often used in Montessori and Waldorf education. You can create your nature table exactly as you like, there are no limits other than the limits of your own imagination. You can be as minimal or as outlandish as you please. 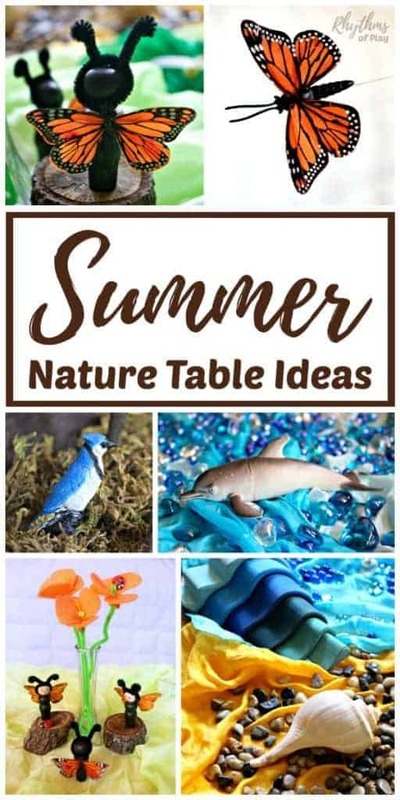 We hope you enjoy creating a summer nature table this summer! You may also like this awesome collection of nature study supplies for kids. Don’t forget to check out our summer bucket list for more seasonal fun. Learn more about Rhythms of Play HERE! Your summer nature table is gorgeous!!! I love the play silks and natural materials and those butterflies you made are too cute. I also like the idea of collecting seasonal books, I’ve never thought of that. Yes it is! It’s a great way to bring the wonder of nature indoors.